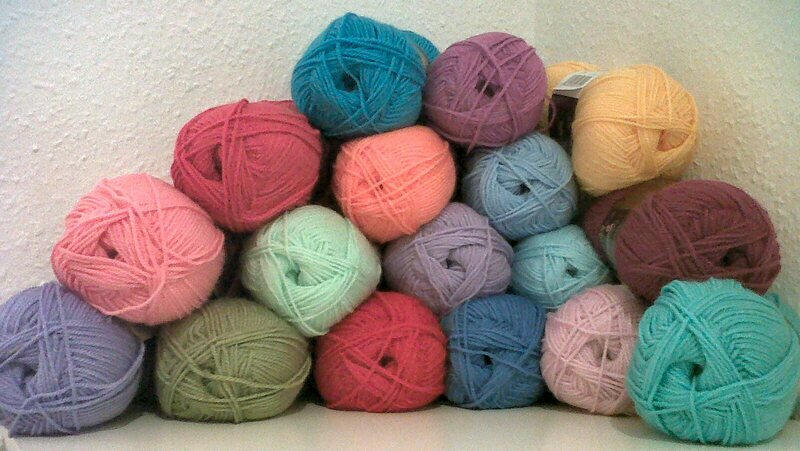 New yarn arrived today and lots of it! We were having a chat on the Posh Knitters forum over on Ravelry about crochet. The term Posh by the way doesn't refer to us (I am not in any way posh) but to our love of Posh Yarn. We were discussing some of the lovely crochet blankets over on the Attic 24 blog. I love reading Lucy's blog its always full of lovely colourful projects which brighten up my day. On Ravelry we found quite a few people had recommended the Stylecraft Special DK for crocheting some of Lucy's designs. I'm not a massive fan of acrylic but they said this was soft and not too hard on the hands, so at £1.99 per 100g I decided to give it a go. I wanted to make a couple of blankets and whilst I might be a bit of a yarn snob at times acrylic is good for blankets because its cheaper to buy in the large quantities needed for a blanket, and its machine washable. This is a serious plus in our house (how do you toilet train a tortoise?). It is very colourful, in fact it is very not me. And despite the fact I bought it following a conversation about crochet, its actually destined to be knitted into a Pop blanket. Its DK and not worsted but I've never let little things like gauge and yarn thickness bother me before. I am still intending on crocheting a blanket from Attic 24 and that's the yarn I'm waiting for in my second parcel. Not quite so colourful but will go better in the living room where I intend on it living. I don't think I've ever bought so much yarn in one go before gulp lets hope this doesn't become a habit!